Note the very distinctive cream forehead, green head stripe and pink-red body of this Male American Wigeon. The Eurasian Wigeon only has a pink-red breast and it's body is mostly grey, it lacks the green head stripe and it's forehead is yellow not cream. 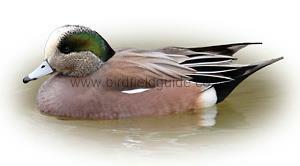 The Male American Wigeon is a small rounded duck. In Winter it has a green head, its flanks are orange-brown and its back is black with pale edged feathers. Its breast is dark with pale bars. 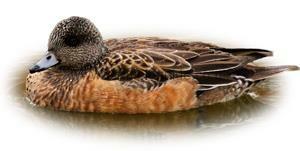 The American Wigeon is an American and Canadian bird, it is a rare straggler to Europe and the UK. Escapees from collections occur. Breeds on marshes and freshwater pools but not usually small ponds. As a vagrant it usually turns up on larger bodies of freshwater such as lakes and reservoirs. 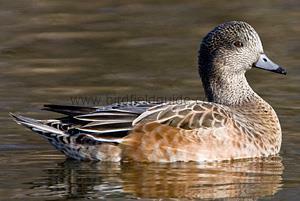 The American Wigeon is a dabbling duck which often feeds on land, gazing fresh vegetation frequently in large flocks. 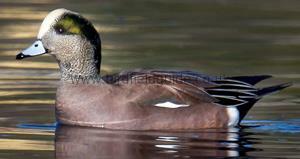 When seen in the UK it is most often in the company of the Eurasian Wigeon. The Female American has rust brown flanks, its back has brown feathers edged with chestnut. The head is dark and mottled and it has a small light patch of white tipped feathers just above the flank where the Males wing bar shows. Male and Female American Wigeon. 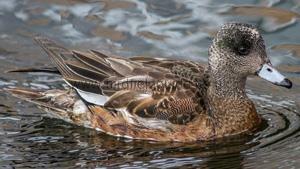 The Female American Wigeon is very similar to the Female Eurasian Wigeon and can be almost impossible to separate. Its head is paler, its breast and flanks are more reddish. The American Wigeon's underwing is whiter in the 'armpits' in flight. Like most wildfowl the Male in winter is much duller. He usually retains a slight amount of green around the eye and his flanks are a reddish-brown. The Male also retains his white wing patch and bill markings. A Female Eurasian Wigeon for comparison. Note the much more uniform, browner appearance.